This summer, I was building cross compilations Apps for broadband commercial routers. It is not an easy task for me but after hours and hours of working I got to install and run a “Hello world” application in my router. However, Apps and remote access services didn't remain after rebooting thus I wanted to go further because my goal is to have root access to do whatever. 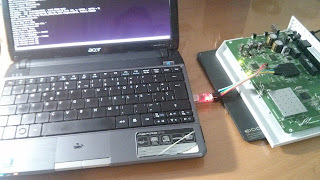 For this reason, this time, I wanted to have access by serial port connector to see the booting process. Let's try with an Orange broadband router. First, surfing on Internet, I found that most routers have a serial port connector called UART and/or JTAG which are for programming and access to the console. It is like the RS232 connectors of computers but it isn't exactly the same, instead, it is a TTL serial, where a logic high ('1') is represented by Vcc, often 5V or 3.3V, and a logic low ('0') is 0V. Therefore, I disassembled the router to look for this connectors and I was looking the way to connect my laptop to the router, where I found two options, an USB-to-UART converter and the BusPirate electronic device, which is more professional and more expensive too, thus I bought the cheapest one, the converter. Next step was to identify the pinout to know which pin is ground (GND), which pin is transmiting information (TX) and which pin can receive information (RX). This is important if we don't want to break/burn the mainboard (PCB) connecting pines in a wrong way. Let's begin with the easiest one, the ground pin. The first pin that we have to identify is the ground (GND) pin. What tools we need? A multimeter. What more we need to know? 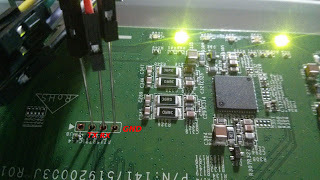 We have to identify a ground place too in the mainboard which is easy because most mainboards have empty places ready for connecting capacitors, where we can see the minus symbol meaning ground. Next, connecting ground to each pin in turn with the multimeter we should look for 0V. 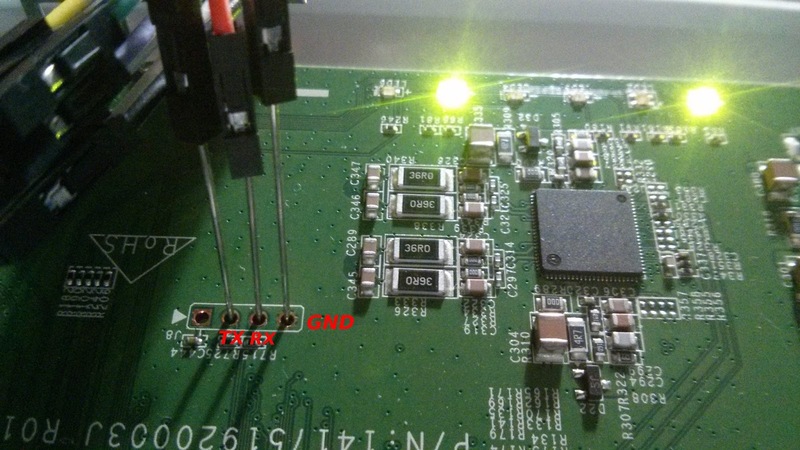 Once we know which pin is ground (GND), the next step is to identify the TX pin. This is a little more difficult because this pin is going to fluctuate between the Vcc value (3.3 volts) and ground (0 volts). Why? Because when it is transmiting bits of data, we'll see 3.3V, and when it is transmiting “spaces”, we'll see 0V. 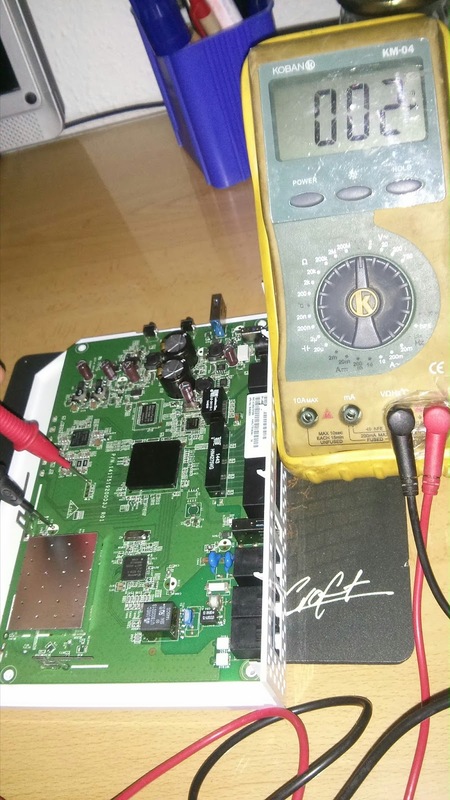 Therefore, we need a good multimeter because if it isn't so, the multimeter will do the average and it will be difficult to identify the TX pin. Another way to meter is with an oscilloscope, which is more expensive than a multimeter, or you can even make your own oscilloscope with your's computer sound card. Finally, we have to identify the RX pin, which is the most difficult one. Why? Because there isn't a pattern. Therefore, the best way will be by process of elimination and connecting the serial converter to all possible receive pins individually, presssing a few keys in our terminal emulator and seeing what happens until we find out which one is the RX pin. 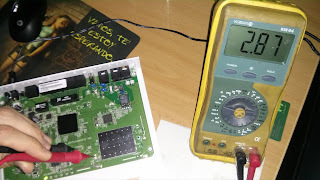 This time, I have fun with an Arcadyan ARV7519RW22-A-LT router, we'll see in next posts how to connect the USB-to-UART converter for seeing the booting process and get the root access in other router as well.